the extraordinary growth of Herbalife abroad, especially in the gargantuan markets of India and China, which may blunt the impact of the FTC settlement. 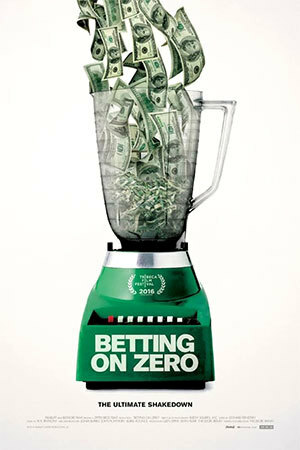 At issue in Betting on Zero is the primary question of which story about Herbalife would stick, whether with its sales agents, throughout the communities in which it operated, within the financial markets, or in courtrooms and regulatory agencies. What would become the prevalent, even official story about Herbalife’s purposes, practices, and impacts? Was the firm a vehicle for social and economic uplift, a mechanism for individuals with minimal education and social capital to build a proprietary business that would deliver the American dream, even make them wealthy? Or was it an especially cruel confidence game that separated the vast majority of its sellers from initial capital investments, and, even worse, turned them into recruiters who ensnared fellow community members in a losing proposition? This debate has been and remains a hotly contested one. After watching this cinematic engagement with a contentious recent episode in the annals of American consumer capitalism, I found myself coming back again and again to a single scene. A few years into the battle waged by Bill Ackman, the camera zooms in on Herbalife CEO Mark Johnson as he addresses a sports stadium filled with Herbalife acolytes. Portraying the company as inevitably beset by establishment naysayers out to destroy Herbalife and the avenues of opportunity that it provided, Johnson proclaimed that he and the Herbalife family would fend off its enemies. The multi-level marketing firm, Johnson explained, would always “seize the narrative.” That might mean shining the public spotlight on hardworking, charismatic Herbalifers who had recruited so many other sales agents that they had ascended into the company’s Millionaire Team. Or proclaiming that in the household where Johnson was raised, the abiding parental message stressed the importance of “integrity” to sustain “trust.” Or reframing the motives of a financial operator like Ackman, implying that his short position undercut any arguments or analysis that he might put forward about the company’s mode of operations. Johnson offered a brash forecast of narrative dominance—that Herbalife would identify the narrative high ground, occupy it, and hold it against all comers. This declaration struck me so forcibly in part because one rarely sees such candor about the role of stories and story-telling in the hurly burly world of American capitalism. Surrounded by insiders, Johnson was willing to pull back the curtain on how corporations approach public relations in the broadest sense—not just through the messages of advertisements and endorsements, but through the wider management of reputation and popular belief. The comment from Johnson also resonated for me because it encapsulates so much of my own work as a historian of American law, policy, and business culture. For a quarter-century, I’ve been writing about fault-lines in American capitalism, the zones of instability created by an economic system depending on widespread trust in economic counterparties. For much of the 1990s, I focused on the legal, social, economic, and cultural problems posed by business failure in the nineteenth-century—those dislocating moments when the era’s firms could not pay their debts. Since then, I have been wrestling with the American flim-flam man (and woman), chasing after alleged and actual business frauds from the early nineteenth-century to the present, as well as investigating the shifting institutional responses to the problem of marketplace deceptions. Stories, of course, help to grease the wheels of modern capitalism. Would be entrepreneurs construct them as they seek to persuade friends and relatives, banks, or venture capital firms to supply them with the funds they need to launch businesses. Advertisers dream up fantasies to convince consumers that some good or service truly offers a crucial need or fulfills some deeply felt want. Even without the prompting of some crisis or scandal, corporate public relations departments construct tales about corporate origins and the essential elements of a firm’s business culture, all to foster employees’ identification with their employer and customers’ identification with the firm’s products or services. In recent decades, business executives have spun yarns about their heroic contributions to financial results to justify gargantuan pay packages. For more than a century now, societies have also confronted a host of meta-stories about the workings of capitalism, such as descriptions (or forecasts) of the business cycle’s predictable arc, moving from growth to boom to bust and recession. Hardly any of this story-making and telling goes uncontested. Savvy investors and lenders do not uncritically embrace the projections of those who seek after capital and credit. In competitive markets, firms challenge each other’s marketing narratives, as do consumer watchdogs and the business press. Labor unions usually offer a very different take on a company’s history and practices from that laid out by management. The same surely goes for social activists and journalistic muckrakers who seek to expose the negative consequences of corporate activity, whether for workers, consumers, or the environment. At least occasionally, stockholders express qualms about the munificence of executive compensation. And even if there is broad consensus about how to describe the business cycle, politicians and pundits hardly have achieved consensus about how much government can or should seek to moderate its swings. These opposing groups usually tell very different stories about the impacts of counter-cyclical monetary and fiscal policy. The business narratives prompted by moments of failure or alleged deception tend to have an especially great urgency about them. For the proprietors, managers, and operators caught in the eye of a given storm, they involve questions of social standing, legitimacy, legal liability, economic future, even personal honor. They turn on interpretations of personal motivation, as well as understandings of the social norms, cultural values, and legal standards that structure economic exchange. And they have a collective dimension. As individual stories of bankruptcy and fraud multiply in a given era, they draw on prevailing macro-stories with familiar plotlines. As those macro-stories evolve in new circumstances, they can also help to establish reform agendas that seek to reconfigure social norms, cultural values, and legal standards. To make these rather abstract points more concrete, consider the following primary sources, each involving a determined effort to “seize the narrative” about a specific enterprise facing existential threats. The first source comes from a New York City bankruptcy case under the 1841 National Bankruptcy Act, the subject of my first book, Navigating Failure: Bankruptcy and Commercial Society in Antebellum America (2001). This short-lived legislation (Congress repealed it in 1843, just thirteen months after it went into operation) gave individuals the chance to petition for a discharge from their debts. Doing so required that petitioners offer a comprehensive list of their assets (most of which they would have to surrender to the federal court where they applied for relief) and their debts (which, if they successfully navigated the legal proceedings, they would no longer have to pay). One can infer a story of failure from this snapshot of property holdings and financial obligations, but such fragmentary evidence poses lots of interpretive challenges. One can of course dig for other relevant evidence about specific paths to insolvency. Occasionally, moreover, petitioners voluntarily offered a fuller account of their troubles as part of their bankruptcy filings. Such moves represented, at least in part, attempts to take out insurance against any counter-stories from creditors, who possessed the right to lodge formal objections to the granting of a bankruptcy discharge, or against eventual misconceptions by lawyers and the judiciary. The document in question comes from the voluntary bankruptcy petition of Granville Sharpe Pattison, a New York City physician who found himself ensnared in complex and allegedly fraudulent land deals during the “mania” of the mid-1830s. Not content to offer up just a list of assets and debts, Pattison offered a detailed story that placed his insolvency in the context of the general asset craze that took hold in the run-up to the Panic of 1837. Describing himself as “excited by the spirit of speculation,” the doctor recounted his eager purchases of Illinois town lots and stock in a copper mining company on the basis of false claims about their value. Sometimes he paid by liquidating other assets. More frequently, amid the heady atmosphere of boom times, the transactions rested on his mere promises to pay in the future. Most importantly, Pattison insisted that he might have avoided insolvency had he been willing to look out only for himself, since he subsequently sold most of the property “to English capitalists at immense advances.” But once he discovered that the sales rested on outright misrepresentations, he claimed that “he spontaneously cancelled all the contracts of sale ... without having been asked to do so,” despite the fact that doing so left him unable to make good on his own debts. As Pattison described his thinking, he would rather “be a Bankrupt in fortune” than allow “the shadow of a suspicion ... [to] rest on the uprightness and rectitude of his character.” Even the handwriting that produced this self-exoneration told a story of sorts, conveying a firm, clear penmanship that invited trust from readers. The next two sources come from twentieth-century entrepreneurs who confronted highly publicized allegations of business fraud, each of whom received some attention in my most recent book, Fraud: An American History from Barnum to Madoff. Edward Lewis, a key figure in Chapter Six of Fraud, developed a cluster of businesses from his early twentieth-century base outside Saint Louis, including a subscription magazine that targeted rural women, a mail order bank, and a correspondence university. His legal troubles began with administrative fraud orders that damaged his core businesses and eventually led to criminal mail fraud proceedings. Glenn W. Turner, who makes a cameo appearance in Chapter Ten of Fraud, ran multi-level marketing schemes in the early 1970s that offered self-help literature/records and cosmetics, as well as opportunities to make income through recruitment of sales agents. His businesses attracted civil actions by a slew of state Attorneys General, as well as the Federal Trade Commission. Though separated by more than six decades and pursuing different businesses, the two businessmen adopted similar strategies in the effort to shape public perceptions and deflect allegations off fraudulent behavior. Lewis vigorously defended himself through his magazine, political and journalistic allies, and an eventual book, published in 1911, Order Number Ten: Being Cursory Comments on Some of the Effects of the Great American Fraud Order, which collected a series of editorials from Lewis’s Woman’s Magazine. I include here the text of the fraud order against Lewis that he placed at the beginning of the volume, the publisher’s preface, Lewis’s “Introductory,” one illustration conveying popular skepticism toward new ideas, his “Afterthoughts,” and a hard-sell recruiting plea at the back of the volume for book agents to market a related volume. These excerpts hit many recurring themes in the narratives offered up by alleged fraudsters: the difficulty of distinguishing economic deception from enthusiastic promotion at the forefront of innovation; the tendency of powerful, entrenched interests—in this case, the Post Office—to discredit competitors that threatened their position; and declarations of deep affection for those investors and customers who stood by him despite unjust persecution. Glenn W. Turner similarly expended considerable effort to convince the public that he, in the words of his authorized biographer, was a “saint” rather than a “con man.” I offer here the text from the back cover of Turner’s 1975 promotional album, “Glenn W. Turner SPEAKS OUT: ‘You Can Better Your Best.’” In this concise marketing pitch, Turner put forward a common rendering from American entrepreneurs of all stripes—the remarkable rise from difficult circumstances—as well as the persistent theme of uplift through a mutualistic sharing of opportunity to others who lack advantages. The authors of these such stories themselves depended deeply on humanistic modes of thought and action. They put forward arguments, evoked sentiments, and sought to influence public opinion and/or official decision-making through personal accounts that drew on widely shared metaphors, tropes, and narrative arcs. For Granville Sharpe Pattison, the voluntary narrative of honorable failure may not have been necessary, since no creditors appeared to challenge his version of events. For both Edward Lewis and Glenn Tucker, tales of innovative striving helped their inveterate investors and customers keep the faith, but lacked punch with officialdom. Each had business empires upended as a result of legal actions; each ended up doing stints in jail as a result of criminal fraud convictions. We are storytellers and consumers of stories, all of us, and not just in the realm of culture or family or other social relations or politics, but also in our economic and legal lives. The sharpest conflicts within modern capitalism turn in large measure on contending efforts to seize the narrative. Granville Sharpe Pattison, Edward Lewis, Glenn Turner, Michael Johnson, Julie Contreras, Bill Ackman and countless others have crafted stories in order to shape agendas, define the realm of the possible, assign blame or credit, justify or undermine, move themselves and others to action. These endeavors may not accord with all or even most of the relevant facts. They do not always manage to attain the highest narrative ground, nor hold it against all the counter-stories pressing up the slopes of our collective culture. But they reflect our essential nature as story-making, story-telling, and story-craving beings, who inevitably construct narratives to render our world intelligible. This basic humanistic insight is crucial for clear-eyed understandings of how modern societies have handled thorny problems such as bankruptcy or business fraud. Indeed, this insight is crucial for making sense of wider questions about how modern capitalism works, who enjoys the fruits of its bounty, who has to bear its risks and costs, and how its mechanics and outcomes accord with our sense of justice. Recognition of this essential perspective also can make us savvier consumers and investors, more thoughtful workers, professionals, managers, owners, and retirees, and more deliberative citizens. If we understand the ubiquity and power of stories in the economic realm, we will be better armed to identify them, to evaluate their basis in fact, and to appreciate their emotional pull. And that level of understanding can only help us as we navigate the complexities of a capitalist society. William Cronon, “A Place for Stories: Nature, History, and Narrative,” Journal of American History 78 (1992): 1347-76. Per Hansen, “From Finance Capitalism to Financialization: A Cultural and Narrative Perspective on 150 Years of Financial History,” Enterprise & Society 15 (2014): 605-42. Frederick Mayer, Narrative Politics: Stories and Collective Action (New York, 2014). This documentary film prompted historian Edward Balleisen to reflect on the powerful and protean role of storytelling in the American imagination, specifically in the realm of modern capitalism. An appreciation of the humanities may provide us with a deeper understanding of the shape-shifting role that stories play in the economic realm. This understanding, in turn, may serve as a compass as we, in Balleisen’s words, “navigate” the world around us.